After filling ourselves up with a delicious lunch, we went back to SM Cebu to buy some snacks and a big bottle of water in preparation for our next activity: Cebu City Tour! Since it's already a package, we let Kuya Joe (that's the driver's name) take charge of our route. I didn't mind which to visit first as long as we visit the places in our list so instead of Taoist Temple, we went to the farther spot first: Top Skyline Garden or simply Tops. Getting there from SM Cebu takes approximately 20 minutes. Since it is on top of a hill, expect steep curves and zig-zag roads (which made me realize that while the romantic view of Cebu and Mactan's city lights make evenings the best time to drop by, an afternoon trip is still the safer choice). Upon entrance, a payment of PhP 100 per head is required. Then here's the opposite side. Sitting in a corner is a bell. It looks like an ordinary bell but let me share with you what is written there, in case the picture is too small to read. "Standing face to face, or around in a circle (for groups), hold hands to unite the bond. With the other hand, ring the bell once for a firm partnership, twice for lasting friendship, or three times to symbolize never-ending Love. Repeat the process on anniversaries to strengthen the bond! For special celebrations, the bell may be rung repetitively." After "the act" we left Tops and drove down the hill to proceed to Taoist Temple. It's located in Beverly Hills Subdivision, home to some of Cebu's wealthiest so expect tight security upon entrance. We got there around 4:30 and were told by the guard to (kind of) hurry as the temple closes at 5pm. We were handed a sheet of paper where rules and regulations are listed down but the main idea is to respect their place of worship. Admission is free, by the way. This is the main gate but tourists enter through the smaller one to its left. Oh, this big gate opens up to an ample parking space so you won't have problems if you're bringing your own car. The main temple will greet you at the end of the staircase. I was born on the year of the dragon so I really wanted a shot here. Haha. After roaming around and posing for photos at just about every corner of the temple, we hopped back to the cab and moved on with our tour. On the way back to the capitol area, we passed by the Heritage of Cebu Monument and our driver insisted (yeah, he did! I like him because he’s even the one telling us to enjoy the sights! :D) that we get off to take souvenir shots. Just across the street is the Yap-Sandiego Ancestral House. Its open 9AM – 6PM daily but we no longer went in since we still have a lot of other spots to visit. Also along the way is Colon Street, dubbed as the oldest street in the Philippines. I took advantage of the red light and took a photo of the marker. In about two minutes, we reached our next stop. I originally wanted to hear mass but we can’t have the driver wait for us for an hour so we just whispered our prayers, took a couple of pictures outside then carried on. A stone’s throw away are Sto. Nino Basilica and Magellan’s Cross – both are packed with church-goers and tourist alike. I grew up a devotee of the child Jesus so it was one stop that I really looked forward to. 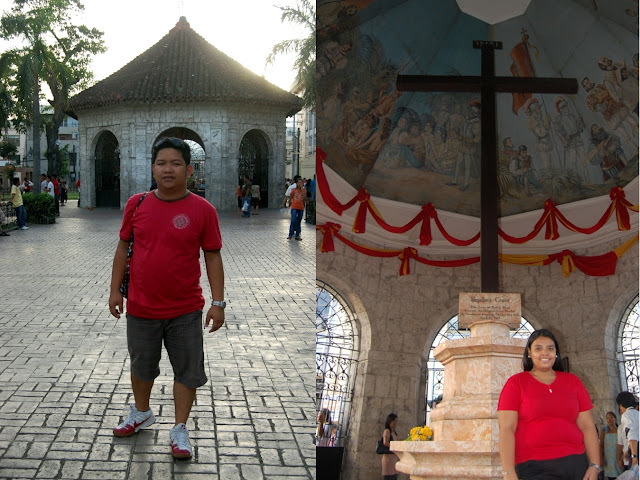 Then we were off to the last item on our itinerary – Mactan Shrine. Being far from Cebu City, this one made the cab rental so much worth it. En route to Mactan, Kuya Joe showed us Fort San Pedro but I decided not to go in (as you know I spent my entire college life “within the walls” so I’m not too excited about another fort... teehee). After a 30-minute drive, we arrived at the shrine. What I thought was just a monument turned out to be a nice little park filled with trees and adorned with lights. I wish I was a little better at photography to capture the beauty of the place at night. This shot didn’t do it justice at all! Souvenirs are relatively cheap in Mactan Shrine as well so I suggest you hoard buy there already. J bought for his mom that white shirt in the photo for 100php. Keychains are 10php each while magnets are at 3 for 50php. Pasalubong Center has lots and lots of shirts with oh-so-cool designs (price range is Php300 - Php600) and we found one that we really really like butttttttt… they don’t have my size :( Looks like someone needs to lose weight. For real. I loved this. I brought some to the office and even my manager said it’s yummy. I wish I bought more :( Each pack costs Php 70. Ballers for J and his bro at PhP 69 each. We were able to maximize the limited tour time that we have. Remember we started past 3pm already but we were still able to go to a lot of tourist spots because we didn’t have to look for them. Kuya Joe took charge of the route but he made it a point to visit all that’s in our list. Each destination is tiring but we get to recharge inside our service cab. With chips and bottles of water plus the refreshing air-conditioning, we’re always re-energized for another pit stop. Kuya Joe is pleasant to be with. He starts small talks but knows when to shush to give us some privacy. He tells us tidbits of Cebu info every now and then and never gets tired of dealing with our questions and requests. He shows no sign of boredom when he waits for us, he just enjoys chit-chatting with fellow taxi drivers during his lull time. And essentially, he understands and speaks Tagalog well so we didn’t have to deal with language barriers. We gave him the all-new PHP bills, thus the smile (kiddin! :D) Let me know if you want his digits and I’ll give it to you by all means so that you too can avail of his service. It was an exhausting but exciting day 1 at the Queen City of the South. Up next, our Bantayan Island adventure! Stay tuned. I can give you his digits but let me warn you narin. Tinawagan sya ng friend ko around August, asking him if they can still have the rate he gave us but he said PhP3000 na daw ang city tour nya. For me that's too much. Let me know if you'd still want to contact him given that price. Hehe. I have yet to update this post to include his new rate.